One of the most beloved World War II trainers is the Piper J-3 Cub. An estimated three-quarters of civilian pilots were trained in the J-3 Cub, which was used for a number of military roles such as reconnaissance and ground control. The Cub was produced in large numbers during the war as the L-4 Grasshopper, swapping out the standard “Lock Haven Yellow” color for a more neutral olive green shade. According to the National Museum of the U.S. Air Force, 90 percent of the U.S. Army Air Forces bombardiers trained in the AT-11, the glass-nosed variant of the Beechcraft Model 18 (Twin Beech). Intended for advanced bombardier and gunnery training, the AT-11 was equipped with a bomb bay, glass nose, and two .30 caliber machine guns. More than 1,500 Beech AT-11s were built and many remained in service until the 1950s. Also known as the SNJ, Harvard, Mosquito, or “Pilot Maker,” the North American Aviation T-6 Texan was one of the most influential trainers in WWII. 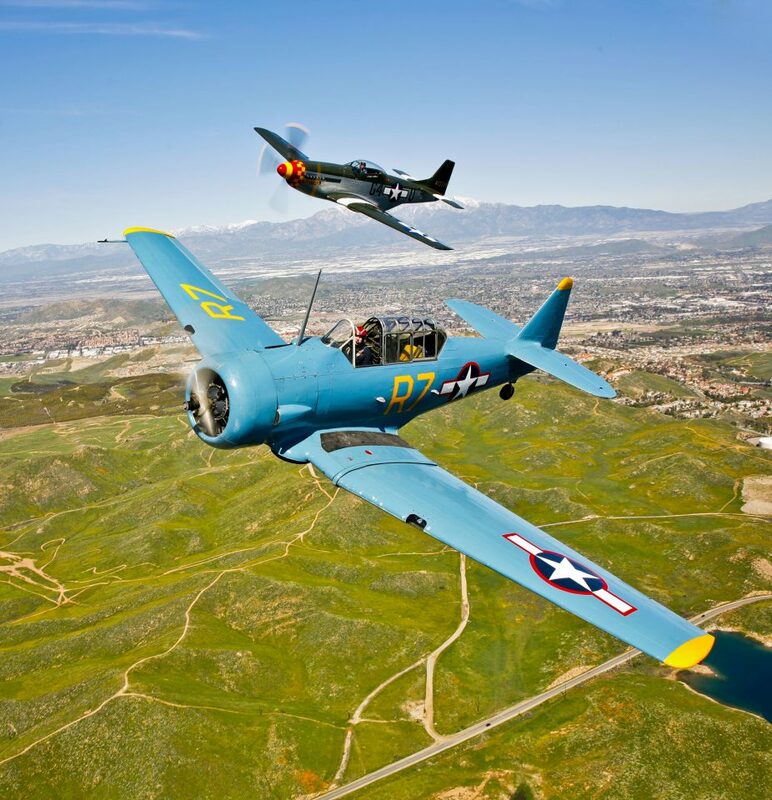 A two-place advanced trainer, the T-6 was designed to prepare skilled student pilots for fighter and bomber aircraft. Several hundred thousand pilots trained in the T-6 for at least 55 different air forces around the world. Besides training, the T-6 was used as a fighter, fighter-bomber, interceptor, forward air controller, and counterinsurgency. The Stearman was an open cockpit biplane used as a primary trainer for the U.S. Army Air Forces, U.S. Navy, and the Royal Canadian Air Force throughout the 1930s and ‘40s. The two-place biplane was powered by a 220 horsepower piston radial engine and stood at over nine feet tall. In the post-war years, surplus PT-17s were auctioned on the civilian market, where many were modified and used as crop dusters, sports planes, and for aerobatic purposes in air shows.